Due to the high cost electricity, most of us use an electric fan instead of an air-conditioning system to save on electric usage. Now that the hot summer months are fast approaching, this cooling device will definitely be working double time. However, as it helps air to circulate it also acquires dust along the way. Regular cleaning will make it work efficiently and at the same time extend its lifespan. It is recommended to clean it on a weekly basis. Here are suggested ways on how to clean an electric fan. Make sure to unplug the fan from the power socket before cleaning and removing the brackets of the fan grill. Take off the grill and wash it with soap and water. Dry it with a clean cloth after washing. Remove the cage and the fan, but if you do not know how to disassemble the cage, do not forcibly remove it, just wipe it with a damp microfiber cloth to take away the dust. The fan blades on the other hand can be easily removed, do wash it with soap and water and dry it with a clean cloth. Let the parts dry before putting them back together. If the blades and grill are made of stainless steel, you may use a vacuum cleaner, blow it backwards, which is the opposite direction that the air normally blows, or you may use a cloth to wipe and remove the dust. Oiling the fan motor will also do good on your fan. Never immerse or clean the motor in water. 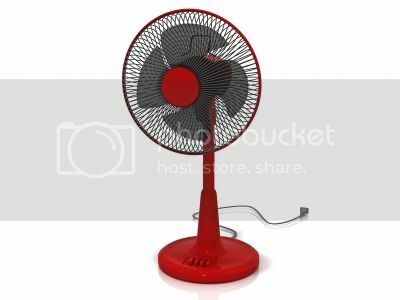 Lastly, it is important to give your fan a half-an hour break daily to allow the motor to cool down to prevent damage. Moreover, unplug the unit when not in use.